Rajal is heterochromic. His right eye is amber colored, while his left is a grey-blue. The top of his head is the same color as the rest of his body, save for a small dark stripe which starts just above his eyes and runs across the top of his head, fading into the rest of the fur just above his neck. The fur at the top of his head is short and lays close to the head, much like a the hair on a terran cougar. 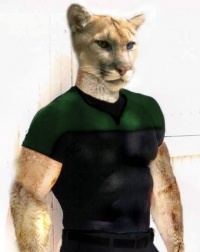 Rajal has markings similar to a Terran cougar Starting from just beneath his chin, short, nearly-white fur runs down the front of his body, also covering the inside of his arms and legs. The rest of his body is covered with a similarly short, but tawny colored, fur. His voice is deep and full of bass. He can speak Terran, but prefers to let the universal translators translate his native language. However, if he does use it, his accent generally sounds forced and unnatural. One of the planets on edge of the Mirak Star League’s territory. Paali (25, status unknown), Barlan (25, status unknown), Jrani (25, status unknown), Ponri (25, status unknown), Mrajin (deceased). Rajal was the second of a litter of six children born to Orana and Jirak. The runt of the litter, Mrajin died shortly after child birth, leaving Rajal to grow up with his brother, Barlan and his 3 sisters, Paali, Jrani and Ponri. Rajal’s childhood was spent on one of the planets on the border of the Mirak Star League’s territory. As such, from an early age he was exposed to raids by neighboring empires, or space pirates. Due to the distance from the core Mirak worlds, the planet was usually left to fend for itself. Shortly after turning ten, his town was raided by the Orion Syndicate. After a series of chaotic attacks that left his parents dead, Rajal and his siblings were taken as prisoners to be sold as slaves. After being branded to identify them as such, the siblings were quickly became separated as they were sold off to different people. Rajal, being somewhat defiant in his new role was beaten severely in an attempt to break his will. For the next five years, Rajal was bounced around from one slave trader to the next, forced to perform heavy labor on their starships. It was during this time that he learned to fight and defend himself, as the slave traders thought nothing of pitting two slaves against each other for sport. He quickly learned to keep his claws sharp and his wits about him at all times. As the years passed, things began to get worse for the young Mirak. Physically, he was growing stronger, and with the increased strength came an increased determination to resist his masters. This resulted in more frequent beatings, which often left him battered and bruised. Just when things seemed at their worst, a Federation ship captured the slave runner he was on, putting an end to his years of servitude. He was grateful to the crew for releasing him and they offered to return him to his home, which he quickly accepted. Arriving home after his long absence, Rajal found his old home to be a completely different place. He had lost his family and most of his clan in the attacks and now there was nothing left for him there. Instead of staying behind and trying to start a new life in a land that was no unfamiliar to him, he took to space. A few more years passed, and Rajal spent the time performing odd jobs on various freighters in return for basic amenities. He quickly discovered that he had a natural aptitude for piloting, especially in smaller more agile craft. This was a skill that earned the young Mirak respect amongst the merchants he worked for, as on more than one occasion his piloting ability managed to save them from pirates and raiders. While Rajal enjoyed piloting, he felt as if there was something more that he could be doing. It was then that his thoughts returned to the Federation. Gathering his meager belongings, he grabbed the first freighter to Earth, hoping to join the Star Fleet. Unfortunately, given his lack of a formal education, there was little hope of him passing the entrance exams. After failing to gain entrance into the Academy, a Star Fleet recruiter suggested that Rajal try the Marines. Joining the Marines at the age of 18, Rajal found himself in a world where his skills in combat and piloting were welcome. He thrived within this new environment, and soaked up all of the information given to him. His piloting abilities earned him both the respect of his peers, and his fellow cadets christened him with the nickname ‘Cougar’. When he asked why he had been given the name, he was told it was due to his resemblance to the Terran animal with the same name. Offended by the notion that he was being compared to a non-sentient Earth creature, Rajal didn’t take kindly to the new moniker. One of his fellow cadets, a good friend named Logan Shively, took him to the Pacific Northwest on leave to show him his namesake. Rajal was skeptical at first, but after viewing the powerful, yet graceful feline in its natural habitat, he finally came to appreciate the name he had been given. In the twelve years that followed, Rajal’s time in the marines transformed him from a rambunctious teenager into a well-disciplined warrior. His time in the SFMC has mellowed him slightly and taught him to focus his energy productively. As such, he is more likely to make plans or wait out a problem rather than rush into it head long. However, even with the additional focus on planning, when it comes time to implement the plan he prefers speed and efficiency. He is also fiercely protective of his fellow marines, due to his seeing the SFMC as his adoptive clan. His recent efforts in the Battle of 157 earned him a promotion to 1st Lieutenant and a position in Dagger Flight, aboard the USS Dauntless. Hobbies and Pastimes: Hunting and Tracking, Exercise, polishing and sharpening his claws. Long-Term Goals: Eradication of the Orion Syndicate. Personality: Rajal is very observant of his surroundings, almost constantly on-guard. He is very loyal to the SFMC seeing them as family. He tries his best to afford the same respect to other members of Star Fleet, but at times he will revert and interact with them as inferiors. He lives in the present, not dueling on the past or worrying about the future. He rarely holds a grudge except in the most extreme circumstances. His nonverbal cues tend to be subtle and unreadable to those unfamiliar with the Mirak. Sense of Humor: He rarely tells jokes, but enjoys hearing them at times. However, due to differences in nonverbal communication between Mirak and other species, to others it may not appear that he enjoyed a joke when, in fact, he found it quite humorous. Phobias: Rajal can experience claustrophobia at times, especially if the enclosed spaces remind him of his time as a slave. Likes: The Terran fish called Tuna, basking in the sun, flying. Dislikes: Being in proximity to large volumes of water, most Terran food, Medics. Bad Habits or Vices: Rajal has the tendency to play with his claws. Usually this entails either the continued protraction/retraction of his claws or protracting his claws and using them to tap flat surfaces. Achievements: Received some notoriety for his heroic actions during the Battle of 157. Disappointments: Returning home to find his clan almost completely wiped out. Strengths: On a physical level, he has better eyesight, strength, and agility than humans, albeit the full effect of his strength is only effective in short bursts. Weaknesses: As he prefers more predatory style solutions to his problems, he finds some social and even some combat situation difficult to handle. Fears: Rajal would normally come across as fearless, but deep down he is afraid of being recaptured by the slave traders. Prejudices: Rajal hates Orions with a passion. As for other species, he recognizes that they each have their own strengths and tries to keep this in mind during social interactions with non-Marines. However, he is still a proud Mirak at heart and the struggle between the two precepts is a difficult one for him. Off Duty Clothing Tastes: When off-duty, he prefers clothing which is tight, yet allows him full mobility. He also prefers more neutral colors, which do not make him stand out in a crowd. Distinguishing Features: His upper right arm was branded to identify him as a slave in the Orion slave trade. He has since had the scarring removed, but the fur on his arm refuses to grow back, leaving a barely visible bare spot in the shape of the original branding. Most Painful Experience: Rajal’s most painful experience consists of the five years he spent as a slave aboard the Orion slave ships. Best Time: His acceptance to and subsequent graduation into the SMCF. Most Crucial Experience: Rajal’s time aboard the slave ships did not just result in bad memories. It also left him with an increased sense of determination and an uncrushable spirit, not to mention the fighting skills he picked up. Role Model: His boot camp instructor, who helped mold Rajal into the man he is today. ↑ Unless otherwise specified, the information contained in this document is rated CONFIDENTIAL. ↑ Please note that familial and historical references to age may be current only to time of retireodment. This page was last modified on 11 October 2014, at 20:02.